For the 105th Carnival of Genealogy we are asked to write about "Your current favorite technology. 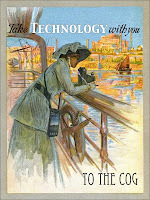 What tech tools are you using in your genealogy research and to record your family history?" It's my favourite tech toy of the moment because it's new. Perhaps it will become my favourite because of its wonderful features, versality and portability but, as I'm still in "getting to know you" mode, I cannot say. I will however share what I have discovered so far. Last week in a post Connecting with the Galaxy I wrote of my decision to buy my Samsung Galaxy Tab. As a connected genealogist one of my first tasks of the day is reading my RSS feeds, Facebook posts, emails and Twitter feed that have come in overnight. The Tab is light at 390 grams and easy to hold up in bed even when I am snuggled down under the covers. It is more comfortable to hold than a netbook and the 7" screen gives a larger display for old eyes than my smartphone. It slips neatly into a handbag so that I can take it on the train or bus to catch up on this reading. I do not have an ebook reader and have found that with the Kindle and Kobo apps I can access and read ebooks comfortably on the device. The 3 megapixel camera on the Tab takes a decent photo. I could use this on research trips to take photos of graves, documents and people. With the Barcode reader I can snap the barcode of any books that I come across that maybe of interest. These can be downloaded into my LibraryThing Account with another Android app. Using the 3G network or free wifi when I am out and about I have access to my online family tree. With the Dropbox app I am able to access other family files that I have stored in the cloud.I have yet to investigate an app that will allow mw to store my tree locally on the Tab. I would be lost without my Outlook calendar. I sync this with my Google Calendar and can access it on the Tab. I particularly like its calendar interface. Whenever I register for a Webinar I select the option to save the event to my calendar and hey presto it is there with all the details. I am a very light mobile phone user and have used it mostly for connecting to the internet and email. One can use the Galaxy Tab as a phone and, with the attached earpiece, one can privately make calls. It would not be suitable for someone who is a heavy user but suffices for occasional use. I think it will be replacing my mobile phone in my handbag. Thankfully the SIM card that I have is suitable for use in the Tab. The camera on my desktop computer is kaput so I have to make Skype calls without video. The Galaxy Tab has a second inbuilt camera that I can use for Skype calls. This will be very useful when I am travelling. My GPS that I use rarely is a few years old. When I went to the Mio site recently to purchase upgraded maps I found that these were not available but I could trade in my GPS on a later model for nearly $200. The Galaxy Tab can be used as a GPS unit, one can even purchase a car cradle for it. I will be using this when I go on research trips instead of purchasing another GPS unit. My keyboarding skills are poor at the best of times and I find typing on the Galaxy Tab a challenge. My skills in this domain may improve but at the moment I am experiencing frustration. I will be purchasing the optional stylus that one can use with the tab and hope that might assist with my input woes. Alternatively I could buy a keyboard. If I can find an acceptable way of typing into the Tab I would leave my other gadgets behind and take it as my only tech toy to conferences, research trips and archives. At the moment I could not use it for blogging or long emails. The uses of this tech toy for genealogy are only limited by one's imagination. For under $AU300 it is one of the best buys I have made in a long time. Interesting post; especially as my COG post was should I buy an iPad on the back of love for the versatility of my iPhone. Some people say size matters but an iPad is just too big for my handbag (and I like having a phone available in one unit). Great info! Thank you. I've been thinking about this. I really would like an all in one device. Off to check the prices in the U.S.
Like your shiny new toy. Gave me new points to consider. Thanks. Hmm, intriguing! I have an iPad but have been curious about other tablets. Very interesting. You really caught my attention with the ability to use your shiny new toy as a phone as well! I wonder if you can purchase a foldup keyboard to hook into your Galaxy. Michelle, You can buy keyboards and a whole lot of other accessories - I am trying to resist or my bargain toey will become a very expensive one. Hypertension also increases your risk of having a stroke or heart attack, and can lead to other diseases as well as make other health conditions even worse. The primary reasons for backaches are strain, fatigue and lack of balance. You should replace meats and dairy products with vegetables, cereals and fruits in order to maintain normal cholesterol levels. It's best to eat small portions or snacks two or more hours before bedtime. [url=http://kinostorage.net/]На нашем кинопортале Вы можете скачать лучшие фильмы бесплатно и без регистрации. Представлены все жанры киновидео индустрии, российские и американские фильмы таких жанров как комедии, мелодрамы, боевики. Большой киноархив популярных качественных фильмов на любой вкус, с удобным поиском по жанрам, рейтингу и новизне. "If it's only a few hundred dollars...."